Form 990 is the Internal Revenue Service (IRS)’s designation for the tax return that most public charities are required by law to submit annually. This form is used by the IRS to assess the non-profit organization for its compliance with tax. Information contained in the form includes a summary of the organization’s activities, assets, receipts, and expenditures. Below is FBA’s completed Form 990-EZ for the calendar year 2010 and Form 990-N for the 2011 to recent calendar year. 12/13/15 – Winter Dinner, Sun Life, Class of 2006 Reunion. 11/01/15 – Howl-o-ween Reflections, FBA T-shirts, Alumni Day at Paul Bell. 10/11/15 – Game Day Prep, Bayfront Cleanup Reflections, Howl-o-ween Prep. 07/19/15 – Bayfront Cleanup II, 3 x H Presentation, Braddock ’05, Winter Dinner. 07/06/15 – Bayfront Cleanup, Intern Posting, Braddock ’05, FBA Growth. 06/14/15 – Bayfront Cleanup, Long-term Events from 2015-2016. 05/03/15 – Run Fur Fun, Spring Picnic, FBA T-Shirts, Friendship Walk. 04/12/15 – Braddock Reunion, FBA @ FIU, FBA Intern, Run Fur Fun. 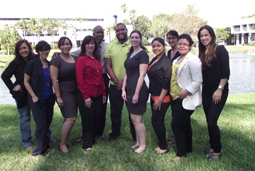 02/15/15 – Networking Happy Hour, FBA @ FIU, FBA Intern. 12/28/14 – Museum Project 5, FBA @ FIU Woes, Braddock ’05, Reconstruction. 12/07/14 – Fall Picnic Reflections, Braddock ’05, Ballroom Update, WD Tickets. 10/12/14 – TK’s Happy Hour, Howloween, FBA @ FIU Woes, Give Miami Day. 09/21/14 – Winter Dinner Committee, ADVENTravel Update, TK’s Happy Hour. 08/15/14 – FBA @ Braddock Update, Black Light Run, FBA @ FIU Meet & Greet. 07/27/14 – Improv Night, Brochures, MUVE Reflections. 06/29/14 – Miami Theater Reflections, Brochures, Summer Projects. 05/30/14 – Miami Theater Project, Brochures, Jeremie M. Status, Braddock Update. 04/27/14 – ADVENTravel Improvements, Forms and Waivers, Braddock Update. 02/04/14 – Maria Balbuena, FCAT Donations, ADVENTravel Camping, CPR. 02/28/14 – Keystone Heights, Spring Picnic, CPR, FIU Updates. 01/17/14 – Winter Dinner Reflections. 04/07/13 – 2013-2014 Board of Director’s meeting. New members and officers. 05/24/13 – D.C. updates, Kiddie Carnival @ FIU, summer activities. 08/17/13 – Museum Project, Zombie Run, Community Relations Position. Please email the FBA secretary at info@foreverbloom.org and request a copy of the 2009 minutes. Please email the FBA secretary at info@foreverbloom.org and request a copy of the 2008 minutes. Please email the FBA secretary at info@foreverbloom.org and request a copy of the 2007 minutes. 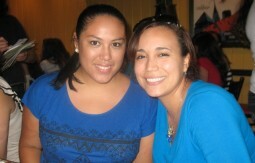 Yesenia Lau and Vanessa Grijalba, former President and Vice President of FBA.